“Interests of the tobacco industry are fundamentally incompatible with the interests of public health.” No other quote stood out as starkly in Dr Ruth Malone’s presentation on her research with the Centre for Tobacco Control Research and Education (2012). Although there are diﬀerences between the problem gambling ﬁeld and tobacco control, the similarities between the two are plain—and if considered in the context outlined by Dr Malone, then public health work in the problem gambling sector is essentially given permission to see the gambling industry as an enemy. That statement, that candid declaration of incompatibility, opens up a world of analysis. The wealth of research she presented to demonstrate just how systemically true that statement is, over and over again, and the commonalities with the gambling industry should not be surprising. In many other facets of public health work, the similarities to industries like “big food,” the infant formula industry, the oil industry, etc. are apparent. How can public health position itself against these industries? There are plenty of possibilities. First, though, it is imperative to reﬂect critically on the actions of the gambling industry based on knowledge of tobacco industry strategy. Doing so may present as a long, slow call to arms—but it is part of a necessary process in an environment where public health is often told to play nice, and that that is what innovation looks like. Looking critically at the industry makes room for a diﬀerent position. 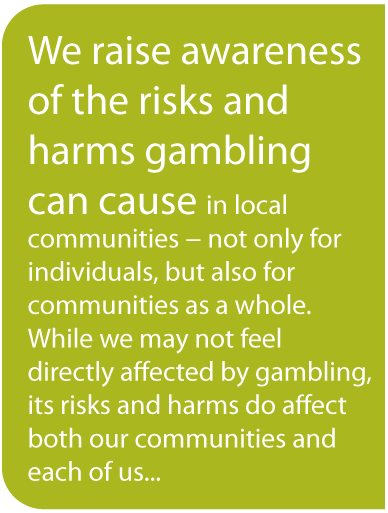 Carefully reasoning through the ways that industry has shown historically and almost unavoidably that their interests are in opposition to those of public health, focussing on tobacco and gambling, teases out the reasons that perhaps public health should not play nice. It gives us permission to organise a diﬀerent game. Nova Scotia’s Informed Player Choice System (IPCS): John Xidos says he’s been in the gaming industry since the “early 80’s, when Pac Man and Space Invaders were around the arcade.” While those classics are considered retro, the project he’s currently involved in, with The Nova Scotia Gaming Corporation (NSGC) is cutting edge and considered a world first in responsible gambling.